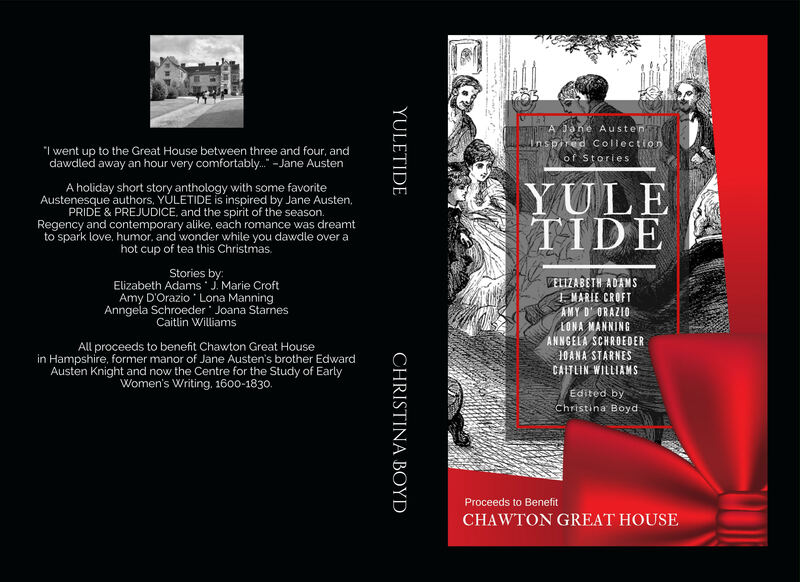 I’m sure you’ve seen several posts online about the release of a new Christmas anthology edited by Christina Boyd, and I’m sure you’ve also noticed that all the proceeds of this book will be donated to Chawton Great House, so it will come as no surprise to you that I HAD to talk about it. First because once more Christina Boyd gathered some of my favorite authors, secondly because it’s a Christmas anthology and thirdly because this book was created for a great cause! Yuletide is currently on my TBR pile and I will start reading it during the Christmas week, which means you may expect a review shortly, but until I can share my opinion of it, I’m sharing Christina’s explanation of how a project like this was built so fast! Nine months after its inception, Rational Creatures was born. It had been a long journey, corralling sixteen authors, working with a new proofer, and implementing lots of DIY promotion ideas. I think it’s the best anthology I have ever been a part of—and I am so grateful of all who helped make it a work to be proud of. I loved that collection of stories written by strong women about some of Austen’s strongest female characters and had been reflecting much on the research library at Chawton Great House, the Centre for the Study of Early Women’s Writing. In the spring of 2017, I had the good fortune to visit Chawton House (the manor of Jane Austen’s brother Edward Austen Knight), as well as the Cottage, along with author Joana Starnes, blogger Mira Magdo, and my dear Mr B. That magical day left a lasting impression on me and I dream of one day returning. Never one to idle long—I was waiting on the manuscript from another author to do a full edit (I suppose we can blame/thank Leigh Dreyer’s manuscript delay for this project!) —and about a week before the #RationalCreatures two-month blog tour was to end, I decided I needed to publish a holiday anthology. In an inspired moment, I thought “How about a Christmas-themed anthology and give all the proceeds to Chawton Great House.” Easy as that, I asked my anthology authors and explained we would have less than a month to make it to holiday market and was anyone interested? Further, unlike previous anthologies, I could not pay them for their stories and asked them to donate their work to this project. After a day, I started doubting myself and thinking this was too ambitious a turn-around time when I woke up to an email from Caitlin Williams, offering a delicious Regency story that she had previously published online. After reading it, I decided I had to go forward with this mad idea. Her story had all the elements that I loved in a holiday romance. Within the next two days, six more brave souls raised their hands and offered their stories. I knew I would edit the stories and decided I could also keep costs down if I designed a cover myself. So, the cover you see is my own work too. It took me longer than I had expected but I learned a lot and am not entirely fearful of that process anymore. Debbie Brown also stepped up and volunteered to sub-edit. It’s always a relief to know there are extra eyes on a project to question all those commas and homophones and phrases. One of my biggest stresses was having to format it myself as I had never done that before, always hiring out. And lo! Karen M Cox offered to format the ebook—and the paperback as well. I had thought to only produce an ebook, imagining I could likely manage formatting an ebook but when Karen volunteered her talents, I jumped at the chance to offer this 190-page paperback too. I gave the authors two weeks, TWO WEEKS, to write a story. Amy D’Orazio had two written stories for me to choose from and I loved her contemporary story, “The Wishing Ball”. J. Marie Croft had a contemporary story idea that she had drafted previously but, like Austen, had put it in a drawer and forgot about. Since I have never read anything by her that was not set in the Regency, of course, I had to have it! I’d say that her story would be great as a Hallmark Christmas movie but I haven’t liked any of the Pride & Prejudice Christmas movies so far—maybe with better casting and production, they might do her story justice! (Let’s all manifest that happy thought into the universe.) Lona Manning had a splendid Regency story idea about Elizabeth Darcy befriending Anne DeBourgh during Christmastide at Rosings and discovering a wonderful secret about that quiet lady. Anngela Schroeder offered a clever alternate Regency story about Elizabeth and Jane spending Christmas in the North with friends–and guess who do they encounter? Of course, Colonel Fitzwilliam, Darcy, and Bingley! Joana Starnes initially had declined this project, thinking she did not have time to write a story but, lucky for me, after a few days, she remembered a Regency story she had published online, developed it further, and voila! That first week, Elizabeth Adams sent me daily snippets of her progress. Then, I opened a message that said she went over the word limit and was no where close to the ending… Heartbroken, I encouraged her to keep on and develop it into a full-length novel. (Because it really is wonderful and, selfish being that I am, must know all the who, what, and wheres—after all those delectable morsels she had teased me with!) Fortuitously, she ended up writing another Regency story in forty-eight hours. FORTY-EIGHT HOURS! I must say I have never been so thankful for email. This project would never had happened on time, nay!—ahead of time—had I been dependent of the post. Imagine if you will the last couple of weeks: I edit a story, return it to the author, back and forth until we get it right, then to Debbie who corrects what I missed, then back to the author to approve or reject, and again back to me. All of that repeated and juggled for all the stories. That’s the abbreviated, less chaotic version, but I think you get the idea and how email made our impossible deadline realistic. (All of that happens on every project but not in this hectic, abbreviated schedule!) Fast forward to the completed collection. I sent the collection to Karen and, over the Thanksgiving holiday weekend, she formatted the anthology for ebook and print. I can’t tell you how much of a relief that step was to me. I think I would still be formatting it had it been left to my learning curve. Thanksgiving indeed! As always, I am forever grateful for the talented authors who have joined me on this journey into the Wild West that is now modern-day publishing and thankful for the peer groups, bloggers, and readers who have encouraged and supported indie projects. A holiday short story anthology with some favorite Austenesque authors, YULETIDE is inspired by Jane Austen’s great works and the spirit of the season. Regency and contemporary alike, each romance was dreamt to spark love, humor, and wonder while you dawdle over a hot cup of tea this Christmas. All proceeds to benefit Chawton Great House in Hampshire, former manor house of Jane Austen’s brother Edward Austen Knight and now the Centre for the Study of Early Women’s Writing, 1600-1830. One of the main reasons I bought this so quickly was due to where a portion of the proceeds will go. I read it and quite enjoyed it. Thank you! Appreciate your review too. Your recommendations have much merit, Sheila. Thank you, Rita! I hope you enjoy the collection and I appreciate you helping to get the work out about our indie projects. Hope your holidays are merry and bright. Thanks for hosting Yuletide, Rita! Hope you’ll have fun curled up with it at Christmas. That was a wonderful idea, Christina. Huge thanks to everyone who made it possible in such a short time! All the best and have a lovely December! Firstly TWO WEEKS! Second FORTYEIGHT HOURS! Third WOW! Such amazing authors, such amazing stories & such an amazing cause. Thank you, Glynis, for yours purchase and kind words! The work is a pleasure when working with such talent. I have been blessed. Thanks, Rita! This is a great collection for a great cause . I was so happy to be able to help with this project in some way. I was working on another story in November and had no “writing chops” left over for another one right then . But when Christina was wondering about formatting, I realized that was how I could contribute. It’s amazing how quickly it all came together. Karen, you were the hero! Thank you!! Nothing like having a deadline! Thanks for hosting, Rita! Let me know what you think of the stories. You know I always want to hear your opinion! Check it out! All the proceeds go to support Chawton Great House. I love how all proceeds of this very affordable book go to Chawton Great House. I love that this anthology includes favourite authors of mine who put their hearts into providing stories under impossible deadlines. And the first story (by Caitlin Williams, who I had not previously heard of) is the most beautiful story ever. Most of the other stories were not my thing for one reason or another – perhaps my mood at the time -, but may well be deeply meaningful to other readers, who I hope will check them out. I am positive every reader will find at least one short story here that touches them and stays with them forever. I loved reading the history of the making of this book. I enjoyed this book and even better that it helps support Chawton Great House. Thank you to all of the authors for writing such delightful Christmas stories. I am in awe of these authors, who apparently can just reach out and grab a muse when it’s needed to crank out a delicious Jane Austen-esque story. I’m the classic case of “Those who can, do; those who can’t, teach” with experience grading school essays but absolutely no creativity to produce the kind of fiction I love to read. Christina reached out to me with the opportunity to be involved in the editing process for Rational Creatures, which was a wonderful experience. With the Chawton Great House being such a worthy and relevant cause, it was a no-brainer to volunteer when she passed along the word that she was putting together a Christmas anthology as a fundraiser. I love working with Christina and all these talented authors! Such an enthralling story of how the idea and stories all came together, Christina. Gorgeous cover. It’s a lovely addition to bookshelves, at home and at Chawton House. I’m really looking forward to reading it. I have this book on my wish list. Looking forward to reading it. Well done to Christina and all the authors, everyone involved in this marvellous project. So looking forward to reading it. It’s on my Kindle! So impressed you managed to pull it together so quickly fabulous! I hope it does really well and raises loads of money for Chawton House, such a worthy cause.